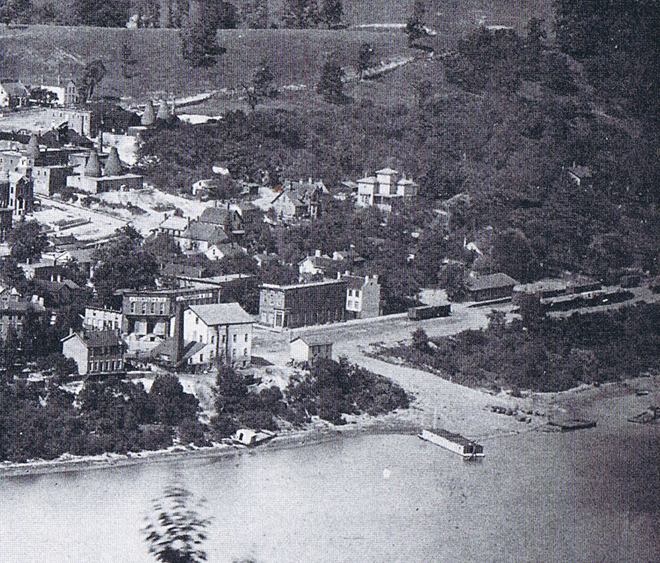 East Liverpool (Fawcettstown) around 1840. Illustration by Glenn H. Waight. 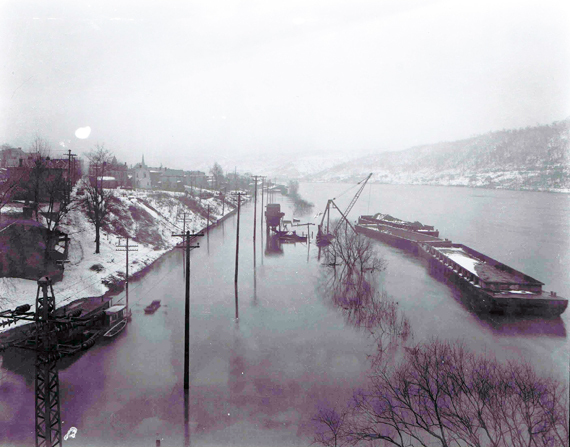 Courtesy of East Liverpool, Ohio Reflections of 200 Years. 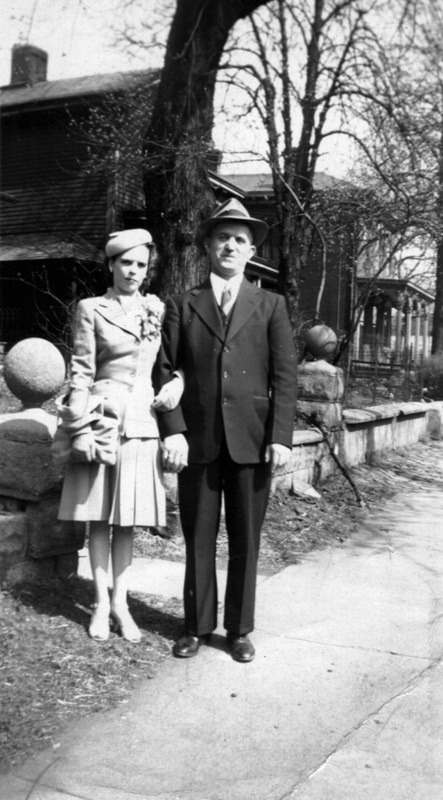 JOan Witt & Glenn H. Waight. Digicolor Advertising & Design for the EL Area Chamber of Commerce, Pam Hoppel, CEO. Choice of articles and pictures. Some of the picture in this section can be enlarged a for good detailed views. 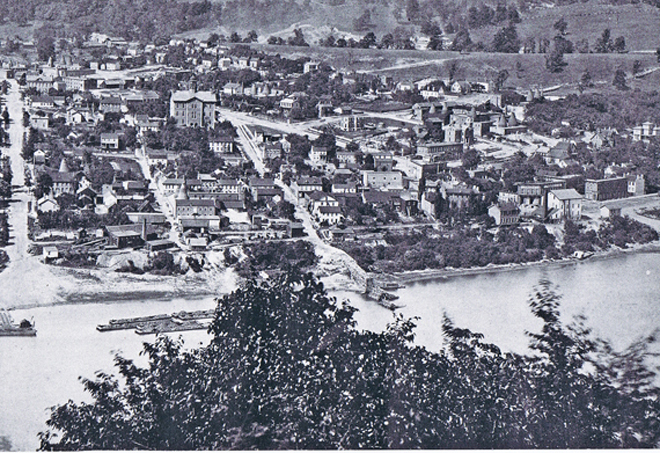 A 1876 photograph taken from the West Virginia side of the river. There isn't much showing of what would become the 200 block of W. 2nd Street, that section west from Jackson Street to Jefferson Street here because there wasn't much there to show in 1876. The street to the right of the picture is Jackson Street with First Street ending at its base. There appears to be a path running westward beyond Jackson Street above the river bank where the railroad will eventually be located. However, in this picture it doesn't seem to be a railroad here yet. Second Street would be the next cross street directly north of that path. Jefferson Street where 2nd Street end doesn't appear that clearly in this photograph. 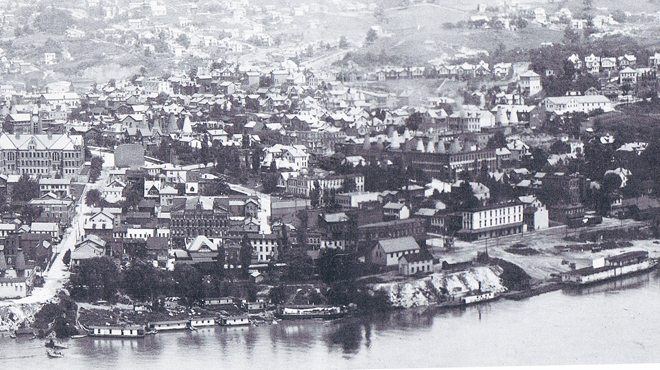 From the same photograph we can see the section of W. 2nd from Jackson Street east to a little beyond Washington Street. 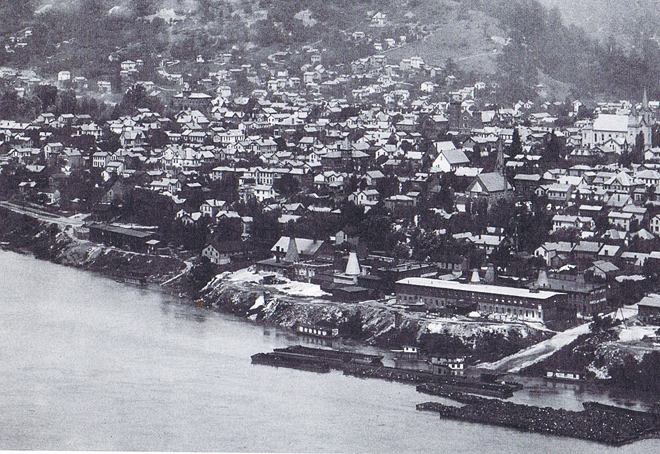 On the extreme left of the picture is Jackson Street. Moving east in the center is Market Street and on the right is Washington Street. If you look at the base of Market Street then let your eyes "walk" north on Market until you come to the pottery with the three kilns on the right of Market Street. That is 2nd Street the intersection of Market Street and 2nd Street. Washington eastward to Broadway. Landmarks are Central School, at the corner of 4th and Union Streets. You can see a house under construction at the corner of Broadway and 4th Street, the site where the High School Building would eventually be built. Also a little further east you can see a second house being built. 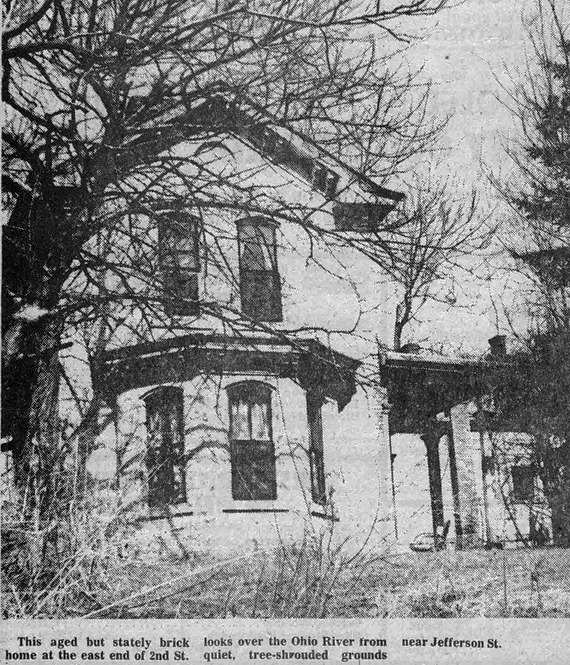 That is the Thompson House. Just a little better view of the base of Broadway. It gets cluttered in the area where Broadway and 2nd Streets meet. The street appearing at the bottom right of the picture is the base of Market Street. 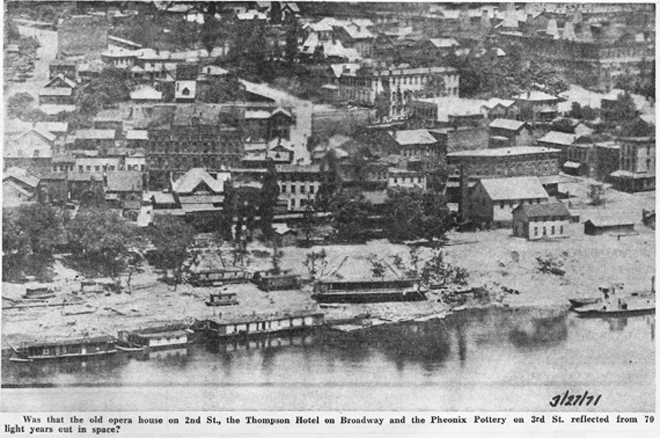 The Street base on the at the far left of the picture is Jackson Street. 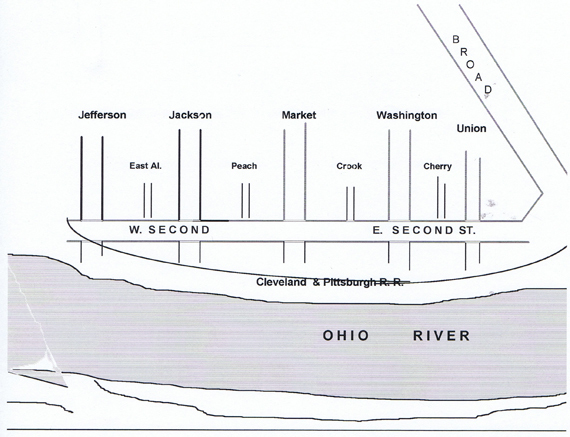 You can locate 2nd street by the pottery with the 3 kilns on Market Street. This is the middle section of 2nd street bordered by Market Street on the left, Washington Street in the middle and Union on the right. We have Union Street on the left and Broadway on the right. We have a good view of the Davidson Opera House on the north side of 2nd Street pretty much in the middle of the picture. Courtesy of The Evening Review, March 27, 1971. We begin this section with an apology. At present we have very few pictures overhead or street level for W 2nd street. We are posting what we do have available at present. Some of the pictures have people in them. Look beyond the people, the value of the pictures here is in the background views, as limited as they are, of 2nd street. Hopefully over time we will run across additional pictures that give a better look at the area. A 1897 Sanborn Fire Insurance Map showing eastern beginning of 2nd Street at Jefferson. 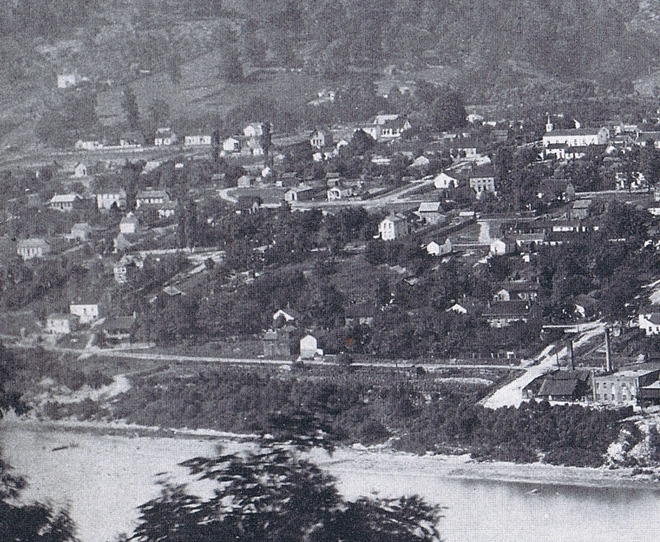 Jefferson Street is on the far right, Jackson Street on the far left. NOte: East West street designations didn't begin until 1900. 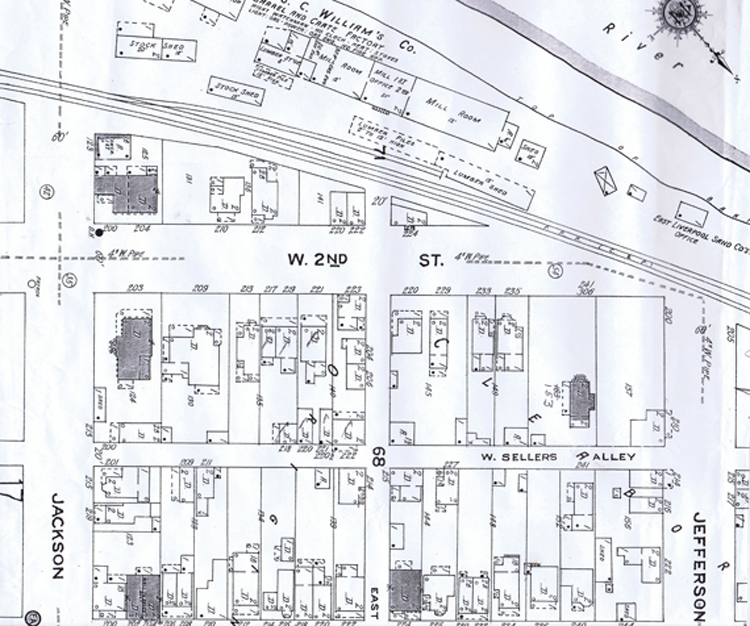 A 1923 Sanborn Fire Insurance Map showing the 200 Block of West 2nd Street. A simple diagram of 2nd Street. 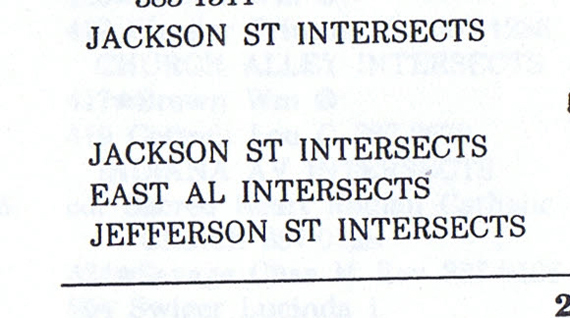 This section covers from Jefferson to Jackson Streets. This is a 1912 picture showing the 200 block of West 2nd street. West 2nd Street ended, or begin at the foot of Jefferson Street. 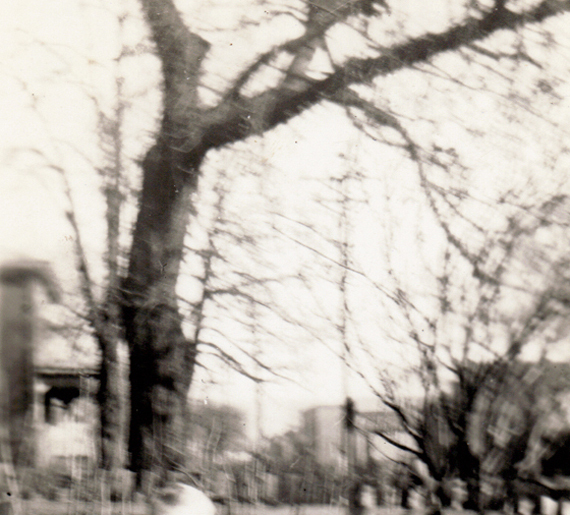 We think that this picture, probably from the 40s' or 50s' shows the western beginning of 2nd Street at Jefferson. It is a good picture depicting that area. There may be a problem with this picture. It says it is located at the east end of 2nd near Jefferson Street. Those are opposing each other. Jefferson St is the west end of W 2nd Street, not the east end of 2nd. So we can't say absolutely if this picture was near Jefferson or Broadway. However, the east End of 2nd was far more commercial in nature and the structures at that end reflected that. Therefore it probably is near Jefferson Street. 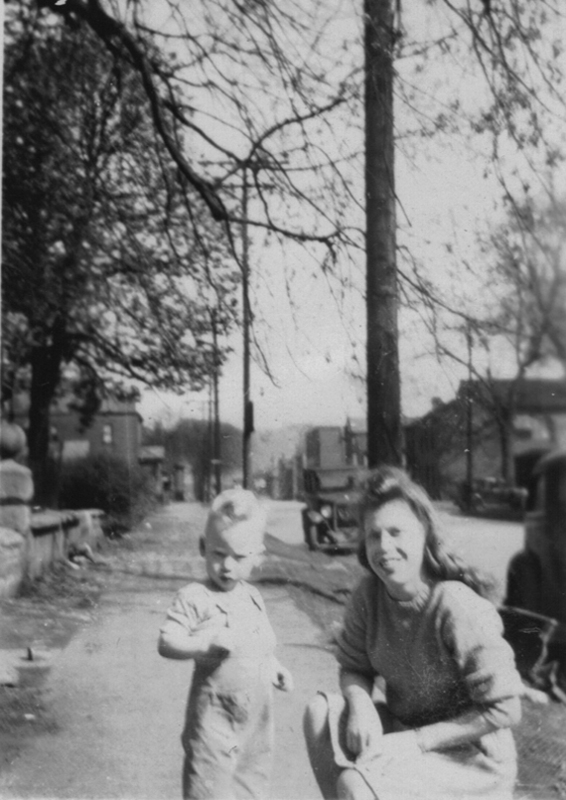 This picture was probably taken in the area in front of 217 W. 2nd street. 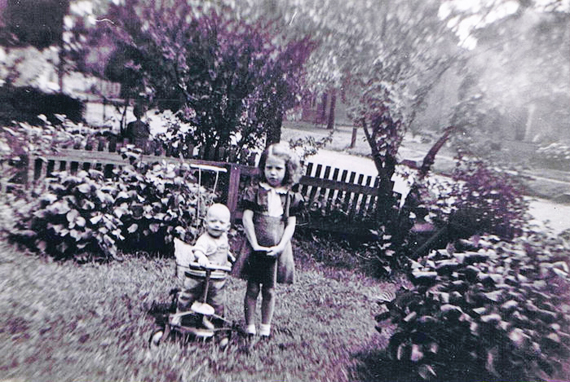 The date of the picture is probably 1945. Looking east. This should be in the yard of 221 West 2nd Street. Date should be early 1940's'. Slightly different view from the same 221 W. 2nd street yard showing some of the south side of the street. The date of the picture was July 1, 1944. 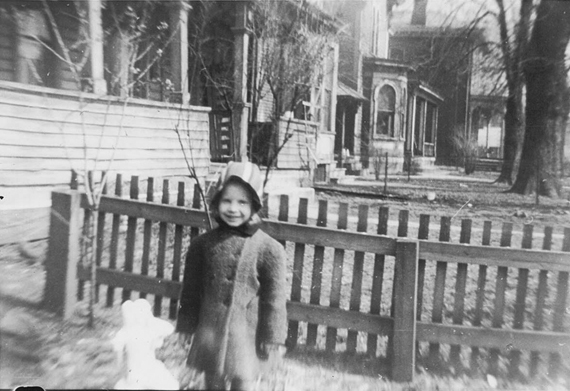 A little out of focus but a view looking towards the business section of 2nd street in the background from the yard of 221 W. 2nd Street. A much better view looking east towards the business section of West 2nd Street .This also was in front of 221 W. 2nd Street. 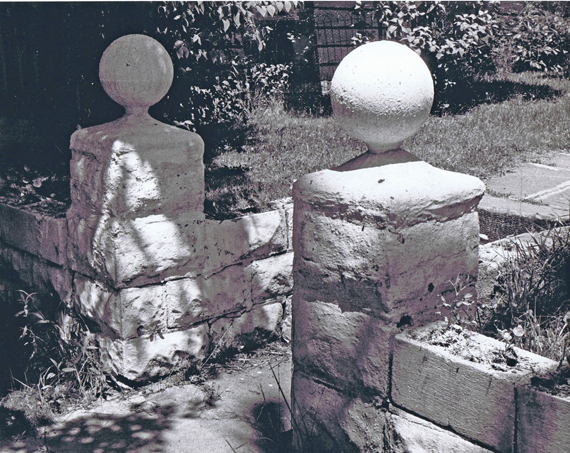 Portions of the West 2nd street residential section had these rather unique entrances to the walk ways to the houses. You can see the "bay" windows of this house in some of the above pictures. Courtesy of Inger Lloyd. Inger Lloyd collection. Looking west. Courtesy of Inger Lloyd. Inger Lloyd collection. 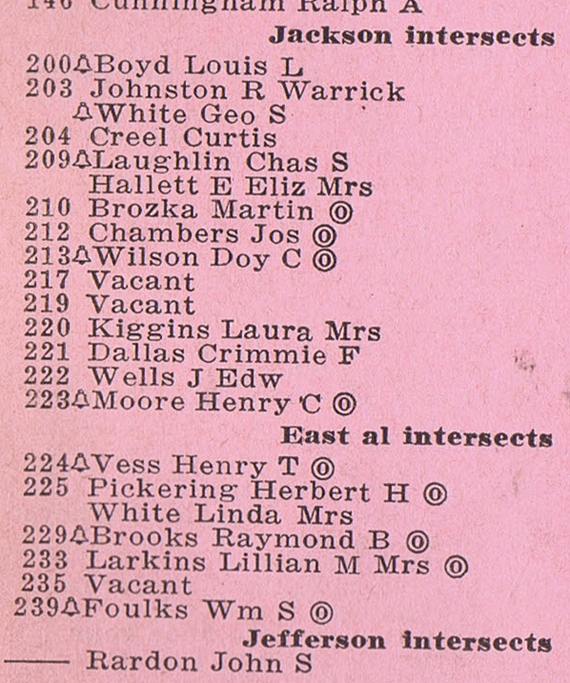 From the 1941 East Liverpool City Directory. 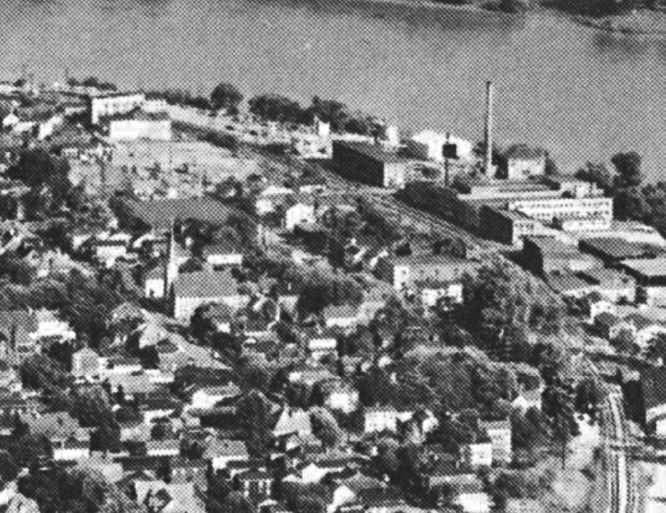 From the 1958 East Liverpool City Directory. 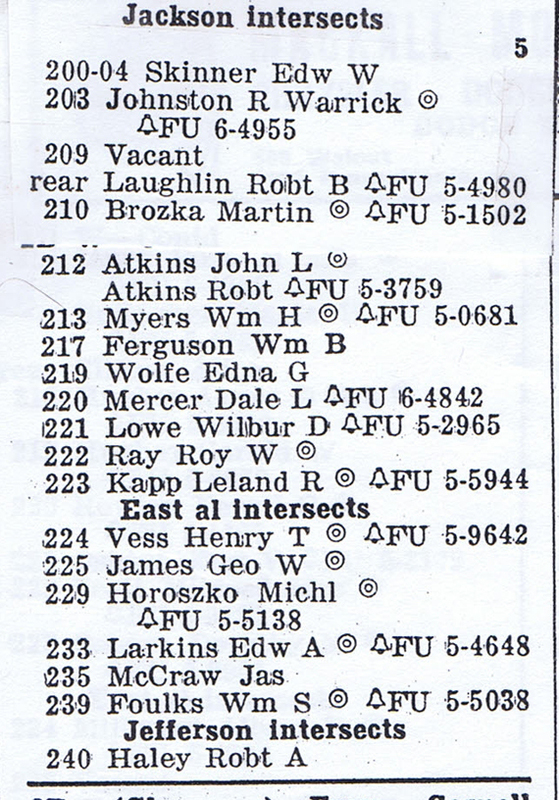 From the 1970 East Liverpool City Directory. 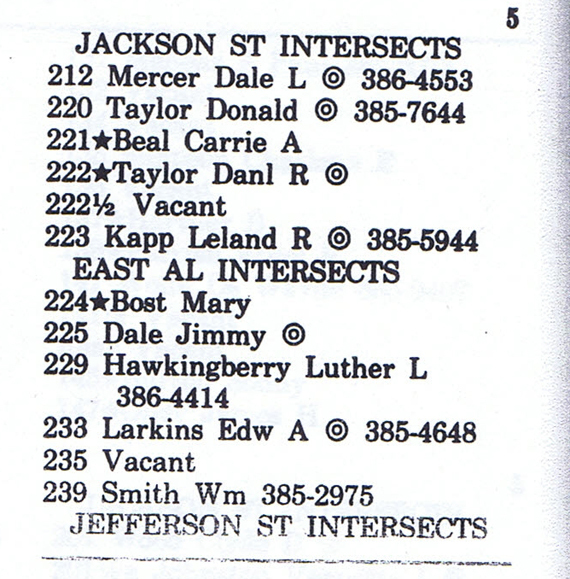 From the 1979 East Liverpool City Directory. 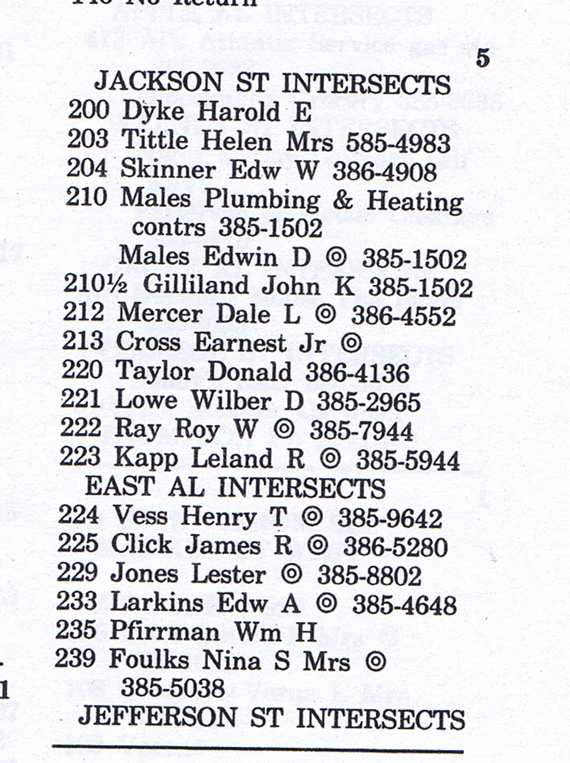 From the 1988 East Liverpool City Directory.